Whooping Cranes migrate 2,500 miles two times each year between their nesting area in Wood Buffalo National Park, Canada and their Aransas Wildlife Refuge winter habitat on the Texas coast. During these migrations they must stop to rest and feed 15 to 30 times. Friends of the Wild Whoopers (FOTWW) is searching for areas to provide these essential “stopover habitats”. Stopover habitats are equally as important as nesting and winter habitats. Fort Supply Lake in northwest Oklahoma is one of four Corps of Engineer (COE) Lakes that have recently been evaluated to determine if they have any existing or potential “stopover habitat” for migrating Whooping Cranes. FOTWW visited the four lakes as part of its continuing efforts to encourage protection and management of decreasing habitat for migrating Whooping Cranes. Despite heavy rainfall, flooding and high water levels in three lakes FOTWW‘s wildlife Biologist Chester McConnell explained that: “Our evaluation team continued towork in the challenging conditions. 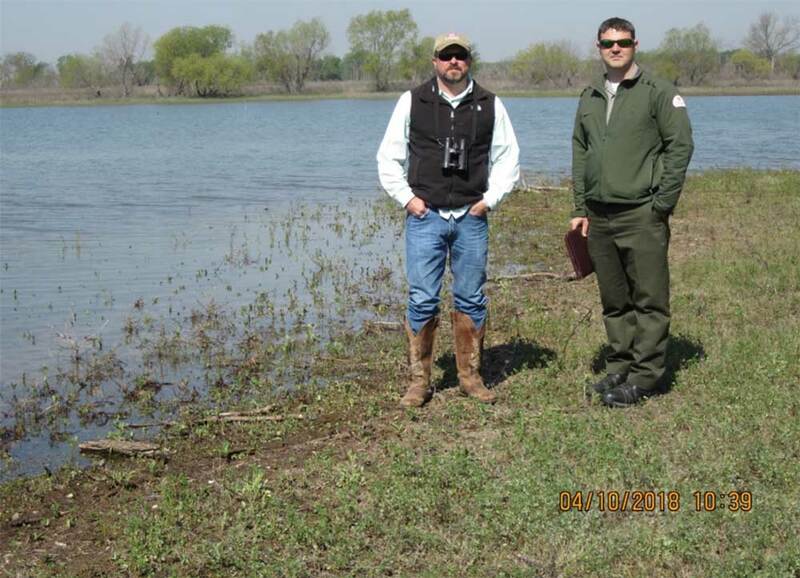 Fortunately COE and Oklahoma Wildlife Division (ODWC) personnel accompanied me and they were well informed about the lake’s habitats. So, together, we successfully identified some good stopover habitat sites.” Fort Supply Lake is just one of many COE lakes that FOTWW has, and will be evaluating. The Operation Management Plan FY 2014 thru 2018 covers information for the COE area of primary management responsibility. The “Wildlife Management/Hunting program” is described in a separate document prepared by ODWC. The lake was authorized under the Flood Control Act approved June 22, 1936. Construction of the lake was begun in October 1938 and completed in August 1942. There is a total of 9,899 acres of project land and water. The lake covers 1,786 surface acres of open water. A total of 8,079 acres are used for wildlife management, recreation and project operations. Although the primary mission is flood control, important secondary benefits are water supply, recreation, and natural resource management. Importantly one of the natural resources needing the lake is the only wild population of wild Whooping Cranes remaining on earth. FOTWW is aware that Fort Supply Lake, has been used by Whooping Cranes and we expect that to continue and increase. Both USACE and ODWC personnel have observed Whooping Cranes on the lake several times. Figure 1. Two members of the team returning from a cruise around Fort Supply Lake to evaluate potential Whooping Crane “stopover habitats”. Eric Summers, Assistant Lake Manager, Corps of Engineers (on right) guided the evaluation team on lake waters. 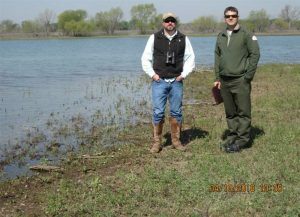 Eddie Wilson, Senior Biologist, Oklahoma Wildlife Division (on left) guided us on a tour of the wildlife management areas around the lake. These men are very informed about the lake and its surrounding wildlife habitats, vegetation and water levels. McConnell said “Their assistance was invaluable and greatly appreciated.” Photo by Chester McConnell, Friends of the Wild Whoopers. Figure 2. The short grass, shallow water and absence of trees and bushes in this photo cause it to be suitable for Whooping Crane “stopover habitat” during normal water levels. During our evaluation, abundant rain (8+ inches) caused the lake depth to be deeper than normal. Water depths vary occasionally due to abundant rain and long drought periods. Importantly, due to various shore configurations, when one area of a lake is not suitable, some other area of the lake will likely be suitable. Photo by Chester McConnell, Friends of the Wild Whoopers. Figure 3. 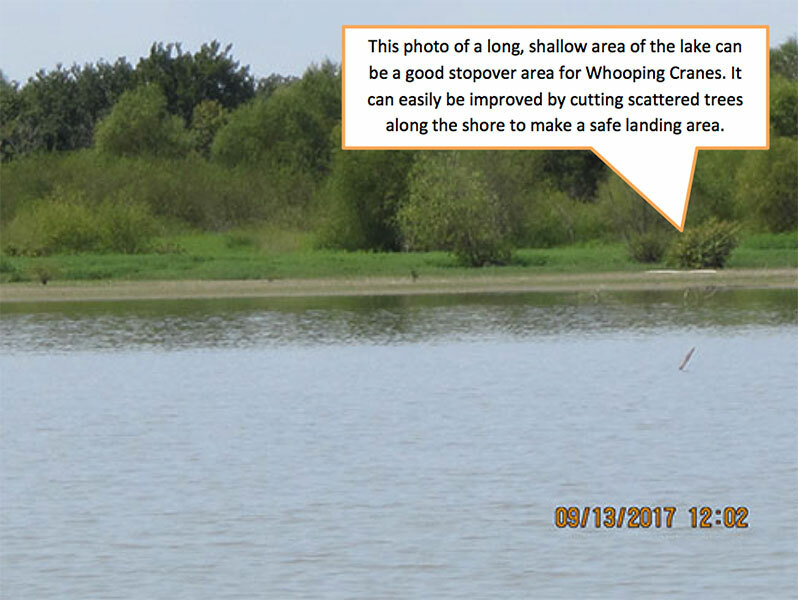 This photo identifies a 3 to 4 acre site near the lake that could be developed into a shallow water“stopover habitat” (3 inches to 6 inches deep) for Whooping Cranes and other wild creatures. The vegetation in the area could be treated with herbicide and burned when dry. A low level berm as outlined can be constructed around the developed pond to hold shallow water for a “stopover habitat”. This small wetland would operate independently from the water levels in the lake. Photo by Chester McConnell, Friends of the Wild Whoopers. Figure 4. 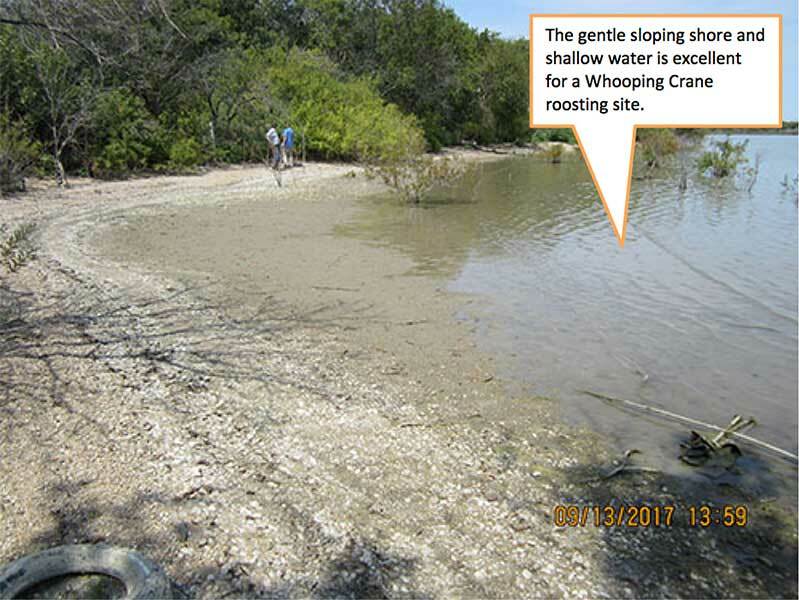 This photo and figure 3 reveals conditions at the 3 to 4 acre site near the lake that could be developed into a shallow water habitat for Whooping Cranes and other wild creatures. The area vegetation could be treated with herbicide and burned when dry. A low level berm (Fig. 3) can be constructed around the pond to hold shallow water (3 inches to 6 inches deep) for a “stopover habitat”. Photo by Chester McConnell, Friends of the Wild Whoopers. Figure 5. ODWC operates the wildlife management and hunting programs on 5,418 acres of Fort Supply Lake. This photo illustrates one of their 21 food plots on the lake property. Whooping Cranes will forage for grain and insects in such plots. Photo by Chester McConnell, Friends of the Wild Whoopers. We would like to thank one of our biggest supporters and cheerleaders, Charles Hardin and his lovely wife, Jen for making and sharing this lovely slideshow with Friends of the Wild Whoopers, (FOTWW). As some of you who know Charles, he and Jen have enjoyed some great winters near Lamar and the Aransas National Wildlife Refuge while our beloved whoopers are spending their winters there. While going through some photos from past winters, Charles decided to make FOTWW a lovely slideshow to share with everyone, hoping that it brings awareness to FOTWW and the only natural remaining wild flock of whooping cranes. We hope you enjoy Charles’ slideshow and we especially hope that you will share it with your friends and social media group members to help spread the word about the wild flock and FOTWW. Thank you again, Charles and Jen! Mostly, during migration Whooping Cranes “stopover” on lakes, natural wetlands and small ponds on private farms just to eat and rest overnight. Like humans on a long trip they just need a small place to briefly stop, feed, rest and then continue their journey. Importantly, Whoopers are compatible with other wildlife and briefly share their habitats. Ensuring that sufficient areas with the proper conditions as stopover sites are available is important for the survival of the species. Sensible practices applied by conservation interest can help reduce potential morality that occurs during migration. McConnell visited Whitney Lake on April 12, 2018 to assess potential habitats for Whooping Cranes. Michael Champagne, USACE – Natural Resources Specialist, Fort Worth District made arrangements for our trip. Nickolus Mouthaan, Park Ranger led us on a tour of the lake to examine all potential places that could provide Whooping Crane “stopover habitats”. Brandon Mobley, Natural Resource Specialist, Fort Worth District Office participated in the tour. We discussed the natural resource objectives for Whitney Lake and needs for management (Figure 1). Figure 1. Brandon Mobley, Natural Resource Specialist, Fort Worth District Office (on left) and Nickolus Mouthaan, Park Ranger (right) joined Chester McConnell, FOTWW during evaluation of “stopover habitats” on Whitney Lake. These men are standing on a broad expanse of grassland adjacent to a large lake inlet in H-10 Hunting Area. This is an excellent area to serve as “stopover habitat” for Whooping Cranes. Any cranes choosing to stopover here would have a wide glide path to land on the lake shore. The site is clear of obstructions and provides a gradual slope into the shallow water which is 2 to 10 inches deep in the roost area. Horizontal visibility around the roost site is good and allows the Whoopers to spot any predator that may be lurking nearby. Whoopers can feed on aquatic animal in the lake and forage on insects and grains in nearby fields. Whitney Lake was authorized by the Flood Control Acts of August 18, 1941 to provide flood control, hydroelectric power, water conservation for domestic and industrial uses, recreation and other beneficial water uses. The lake is located along the county lines of Hill and Bosque Counties on the main stem of the Brazos River. It encompasses a total of 49,820 acres and has a flood capacity of 1,372,400 acre-feet of water. At elevation 533 feet above Mean Sea Level (MSL), the normal pool level, the lake covers 23,560 acres and has a capacity of 627,100 acre feet. Approximately 13,500 acres of government-owned land surrounding the lake are dedicated as natural areas. Primarily used for flood storage, this land is also intended for low impact public use with a minimum of facilities provided. The lake’s large size and diverse habitat support a number of native and introduced species of fish. The lake is a common stopping, resting and feeding area for Whooping Cranes, ducks, geese, shore birds and other waterfowl. 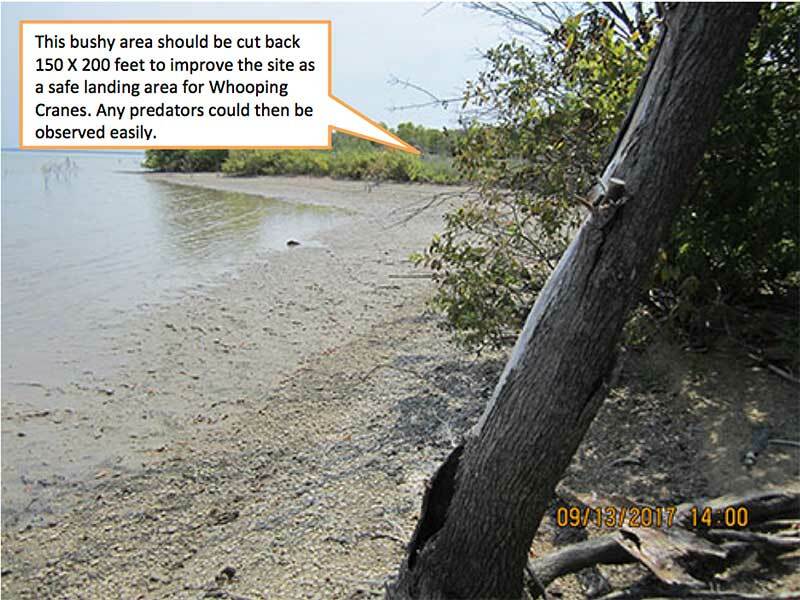 This same land is primarily where FOTWW has recommended projects to increase benefits for Whooping Cranes (Figure 2). Figure 2. This shore area on Whitney Lake is clear of obstructions and vegetation is short due partially to fluctuations in lake water levels. Any nearby predators could be easily detected. The water is shallow (2 to 10 inches) making it an excellent roost area. Overall it is an excellent Whooping Crane “stopover site”. Bardwell Lake is an important link in a virtual chain of lakes within the Whooping Crane migration corridor. Bardwell has been visited by wild Whooping Cranes several times in recent years. Friends of the Wild Whoopers (FOTWW) believe that such visits are increasing due to two factors. First, some of the traditional sites where Whooping Cranes have stopped over to rest and feed have been eliminated due to changes in land use. Many thousands of wetland acres and small ponds within the Whooping Crane migration corridor have been converted to other uses. Likewise the increasing population of Whooping Cranes is using additional areas to stopover to rest and feed. They must stop 15 to 20 times to rest and feed during each of their two 2,500 mile migrations each year. They migrate to and from their Texas coast wintering grounds to their Canadian nesting area. FOTWW is evaluating U.S. Army Corps of Engineers (USACE) lakes within the Whooping Crane migration corridor to assist in protecting and improving existing habitats and to encourage development of new stopover habitats. 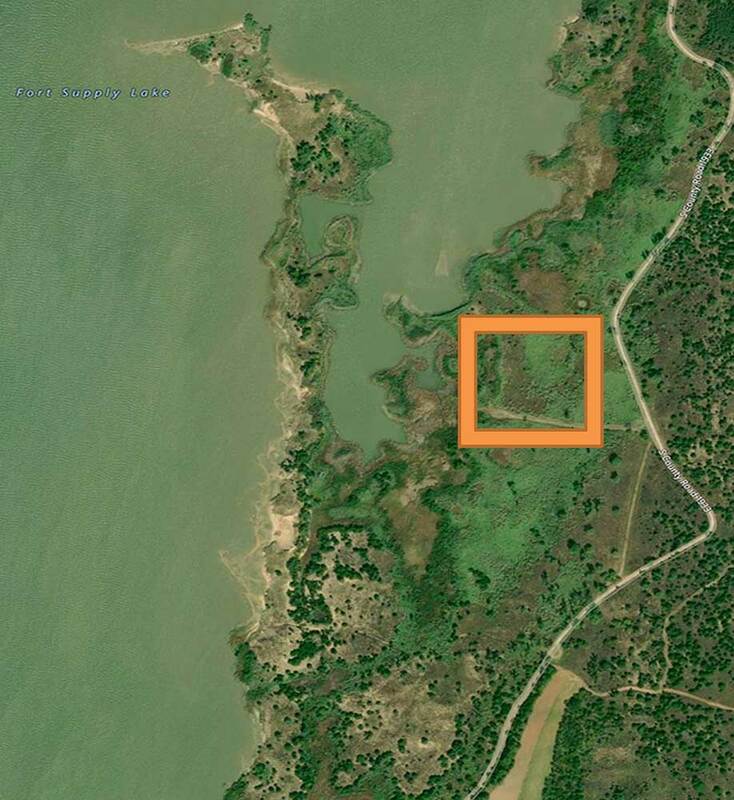 Bardwell Lake is about 45 miles south of Dallas, TX and has much potential for habitat improvements. FOTWW Wildlife Biologist Chester McConnell visited Bardwell Lake to assess potential “stopover habitats” for Whooping Cranes. Martin Underwood, USACE – Environmental Stewardship (CESWF) made arrangements for our visit. Martin Underwood, James Murphy (Deputy Operations Project Manager, Trinity Regional Project) and McConnell traveled to Bardwell Lake. After discussing the natural resource objectives for Bardwell Lake with Lake Manager Jeremy Spencer, we made a tour of the lake property to examine the most likely places that would provide Whooping Crane “stopover habitats”. FOTWW appreciates all involved with making preparations for an interesting, productive and enjoyable visit. Congress approved an act on March 31, 1960, authorizing construction of Bardwell Lake by the U.S. Army Corps of Engineers. Construction began in September 1963 with impoundment beginning in November 1965. The total construction cost was $12,630,000. Built to provide flood control and water conservation, Bardwell Lake and Dam controls runoff from 178 square miles of drainage area. At conservation level the lake is 5.4 miles long, 1.2 miles at its widest point, and has a shoreline of 25 miles. The lake has a fee owned perimeter of 39 miles. The total fee simple acreage (government owned property) is 7,488 acres with 675 acres of flowage easement lands (private property the government has an agreement with the landowners to flood.) Of this total acreage in fee simple, 3,570 is water area and 3,918 acres is land area above the conservation pool elevation. Although not a primary purpose for the construction of Bardwell Lake, recreation has increasingly become a major component in the U.S. Army Corps of Engineers’ multiple use approach to managing our nation’s resources. Recreation and favorable fish and wildlife habitats are other beneficial uses derived from this lake and others like it, built and operated by the Corps of Engineers. Much of Bardwell Lake’s shore area is developed for recreational use and Whooping Crane “stopover habitat” is not compatible in some of these areas. The lake is shallow but most is not shallow enough for roosting areas. Whooping Cranes normally roost in areas with a depth of 2 inches to 10 inches. Importantly, some very good stopover habitats are located on the north western and north eastern areas of the lake shore. FOTWW recommended that Whooping Crane stopover habitat management efforts should focus on these areas. COE lakes within the 6 state migration corridor may become even more important to Whooping Cranes in the near future because of their locations and quality of “stopover habitats”. Bardwell Lake and others that are located in the mid-section of the Whooping Crane migration corridor can be especially valuable. As the crane population increases the migration corridor may also expand in width. The photographs that follow were taken on Bardwell Lake. They show some very good stopover habitats that need a small amount of inexpensive management. Figure 1. This photo taken on the northeast side of lake illustrates a sample of a long expanse of open shore with a gentle slope into shallow water. The entire Bardwell Lake is shallow but the northeast side has over a mile of mostly open shore with a gradual slope into shallow water. The shore has some areas where trees are too close on the shore and need to be cut back so Whooping Cranes have an open glide path to a safe landing shore area. Figure 2. 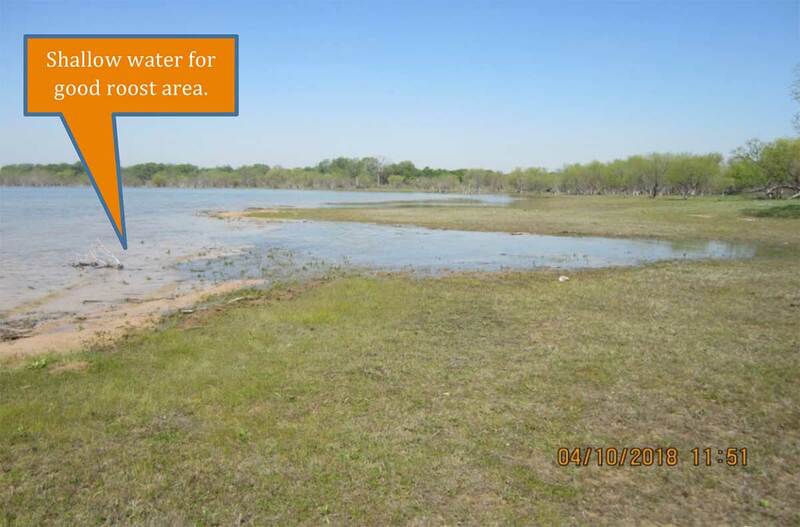 This photo depicts another section of shore on the northeast side of Bardwell Lake. Note that the shore is open with a gradual slope into very shallow water. This area of Bardwell Lake could be improved as a Whooping Crane stopover site if the bushes were cut back with a rotary cutter (Bush hog) a distance of 150 X 200 feet. The water is shallow all along this section of the shore. Much of the water is in the 2 inch to 10 inches depth range which the cranes need for roosting sites. Foraging for food is available in nearby agricultural fields. Figure 3. This photo was made on the northwest portion of Bardwell Lake. The water is shallow (one foot and less) in most of the area shown in this photo. Also much of the shore area is open with a few scattered trees. While this area could be a good stopover area currently, it can be improved by removing the few scattered trees on the shore. Much of the lake shore of the northwest arm of the lake is similar to this.